It seems almost common knowledge now about how inactivity typically leads to chronic and dangerous health conditions such as obesity, diabetes, heart disease, and many more. 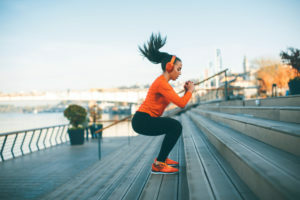 This has led many of us to make an effort to exercise more, but did you know how important and beneficial exercising is for your mental health? Increase in Happy Brain Chemicals: Endorphins are chemicals in the brain that create feelings of happiness, making you feel good. Exercise actually releases more endorphins, providing you with a boost in your spirits. During and after exercise, your brain will have released enough endorphins to leave you feeling much more energized and in a better mood. Reduces Stress: Stress can typically manifest itself in the form of tightness in the muscles in your neck, shoulders, and back, leading to headaches or neck and back pain. You can even feel tightness all throughout your body. However, exercise helps relax the muscles and relieves the tension in your body. Exercise increases the concentration of norepinephrine which is a chemical your brain produces as a response to stress. Boost Self-Esteem: If you eventually make exercise a habit, it can be useful in boosting your self-esteem. On a basic level, exercise can help you lose weight and make you feel better about your physical appearance. It can also make you feel accomplished after every mile ran or every weight lifted. Setting goals for yourself and accomplishing them is a great one to boost your self-esteem while working out. Improved Sleep: Regularly exercising can also help you regulate your sleep patterns. By getting a good workout in, you can exhaust your body. A moderate workout has been seen as the equivalent or even better than sleeping pills. By raising the body’s core temperature hours before bedtime, your body will eventually cool to a normal core temperature, telling your body it’s time to sleep. Sharpen Memory and Focus: Those same endorphins that help boost feelings of positivity and euphoria in your body also help your mind concentrate and focus on any task at hand. Exercise increases your brain’s production of cells in the hippocampus, the area responsible for memory and learning. This also helps you fight against age-related declines in your cognitive mental state. Increase Energy: While this may seem backward, regular exercise can actually increase your level of endurance and energy. Oxygen and other important nutrients are sent to the tissues that make your cardiovascular system work more efficiently. If those tissues are working better, your energy levels will surely increase. Healthy Coping: An unexpected benefit of exercise is that it gives you a better way of coping with any mental or emotional struggles you may be plagued with. Instead of leaning on alcohol, drugs, or other counterproductive behaviors, you can rely on exercise. For those struggling with mental health issues, it can sometimes feel like there is no way out. You may have reservations about relying on medication to help with your condition which may leave you with few options. However, exercise is a wonderful option for those who are looking for a more natural and productive means to treat their mental health. Pair it with regularly seeing a mental health counselor, and you will have a healthy and consistent treatment plan. If you are interested in more benefits of exercise for your mental health or are seeking a mental health therapy center, contact LifeWorks Counseling Center to let us help you with any questions you may have.